These sweltering days of July, hardly a headline in the Bulgarian media goes by without having the word ?protest? somewhere in it. Police have been protesting for higher pay. Medics have been protesting for better security to protect them from assaults. There have been protests for improved road safety, in a country with the highest road accident death rate in the EU. Former employees of a failed supermarket chain have been protesting to get months of salaries owed to them. Amid this season of protests, two stand out in particular, because of what they say about the state of Bulgaria. This examination of both is an endorsement of neither. This past Sunday in Assenovgrad, a town about 20km south of Bulgaria?s second city Plovdiv, there was a protest that drew ? depending on which media report you believe, if any ? participation of 5000 to 15 000 people (the latter figure may safely be written off as confirmation that not all journalists are capable of estimating crowd size, or as an indication of an agenda). The protest was the latest in a series that began a few days earlier. Whatever the true figure, in a town with a population of just more than 50 000, that is a large protest. But then, some media reports inaccurately described it as a protest by residents of Assenovgrad. Others pointed out that participants included people from all over Bulgaria, who came to the town for the occasion. For the sake of brevity, some headline-writers described the Assenovgrad protest as an ?anti-Roma? or ?anti-gypsy? one. That it had that ethnic or racial element is unquestionable. Television pictures showed numerous of the kind of participants generally associated with racist events ? the shorn-headed ?football fans?, radiating aggression, of a type who can be relied on to turn out for, for instance, counter-protests to Sofia Pride, the assault a few years ago on the mosque in Plovdiv, or for the annual Lukov March. But lest we err in writing off the people of Assenovgrad as racists to the last, let us consider the state of the town. Two years ago, its police chief and a number of other officers were arrested for corruption. The allegations included everything from covering up a murder to habitually eating and drinking at restaurants and leaving without paying. More recently, in 2017, charges were lodged against the mayor, chief architect and some business people of involvement in alleged irregularities regarding a construction scheme (all deny wrongdoing). Assenovgrad, on the face of it, is a troubled place. It is, however, not these issues that led to the huge protests in Assenovgrad in recent weeks. The facts are disputed, but the catalyst for the protests was an assault on a rowing team by people from Assenovgrad?s Roma area. Going by the claims of the protesters, this was hardly the first such incident of conflict. The demands of the protesters were for the deployment of more police in the town, the demolition of illegal buildings in the Roma area and the most severe possible punishment for those involved in the assault. They also want a ban on bathing in the fountains in the centre of the town. This kind of thing is, of course, grist to the mill of Bulgaria?s ultra-nationalist politicians. In all recent elections, action against what they call ?gypsy crime? has been among their signature issues. It was no surprise that Valeri Simeonov, deputy prime minister and a co-leader of the United Patriots that is the minority partner in the current government, went hurrying off to Assenovgrad. Simeonov has made himself very visible in the issue ? most recently, even brokering a suspension of the protests amid promises of official action. Nationalist politicians were hardly the only ones to swiftly associate themselves with Assenovgrad. On July 3, Petar ?The Feather? Nizamov was there too. Nizamov first gained prominence in 2016 when he was charged for allegedly, in his capacity as a ?migrant hunter?, illegally detaining refugees and binding their wrists with plastic packaging ties. He denied wrongdoing and was acquitted by a court. Now he faces charges again, this time for allegedly assaulting a television cameraman during the July 3 protest in Assenovgrad. Some Bulgarian media referred to the presence of ?provocateurs? in the crowds at the Assenovgrad protests. That may be, and as distasteful as the racist element is, there is no reason not to take these protests seriously. Because the Assenovgrad protests are hardly the first in Bulgaria in recent years to arise out of local conflicts between Roma and non-Roma people in small towns. Around the same time as this past weekend?s large protest, there was another in Byala, also arising from someone having been seriously injured in a fight. When these incidents happen, there is a flurry of attention for a few days, a brief indulgence in hand-wringing, commentators are rustled up for the television talk shows, and then it all dies down again ? until the next time. The only gain has been made by far-right politicians, who offer offensive rhetoric and apartheid solutions. And the next protest, wherever it is, will again see those shorn-headed young men gathering like flies, spoiling for trouble. And sooner or later, there will be trouble, as long as those in power in Bulgaria allow these issues to fester. Dismissing every protest by people who may have legitimate concerns about their safety and security, while paying little more than lip service to the issue of the integration of the Bulgarian Roma population, will never yield a solution. 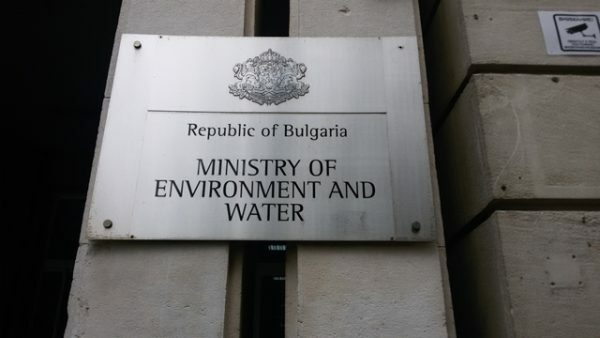 Meanwhile, in Sofia, the long-running dispute about the ?1300 Years of Bulgaria? illustrates another national issue, the absence of education and coherent debate about the country?s recent past. The monument was put up by the communist regime in 1981. The 35m-high structure was a rush job, completed in just eight months to be in time for the lavish celebrations. Accounts have it that in just a few years, bits started falling off. The beginning of the 1990s brought the start of the transition to democracy. The freedom to be openly anti-communist spelt doom, to varying degrees, for all such monuments. The red star was airlifted from atop the Party House in the Bulgarian capital. Various Lenins disappeared from public view, some later to reappear at the Museum of Socialist Art in Sofia, alongside other communist bric-a-brac. And the ?1300 Years of Bulgaria? was allowed to continue to disintegrate. Some monuments have remained, of course, notably those with a direct Soviet connection, any attempt at removal of which immediately led to protest notes from Moscow?s embassy in Sofia. Aloysha, machine-gun in hand, still looms over Plovdiv. The edifice above Varna remains in place. The Soviet Army Monument in Sofia, however much it periodically is informally redecorated (as popular culture characters, once, in Ukrainian colours, on another occasions), is a fixture. But the ?1300 Years of Bulgaria? monument had no such protection, and ideological considerations aside, was through poor construction and wilful neglect, an increasing hazard. The argument whether to restore it or demolish it continues to this day, as another protest to protect it is planned. 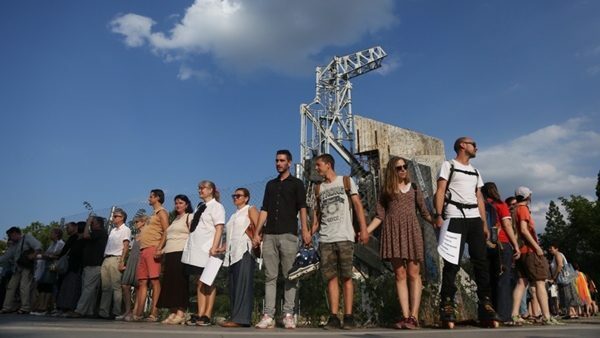 A human chain at an earlier protest in defence of the ?1300 Years of Bulgaria? monument in Sofia. To the final instance, the courts have given the go-ahead to Sofia municipality?s 2014 decision to take down the monument. Its defenders, however, have not relinquished the fight. Apart from the socialists ? the political inheritors of the Bulgarian Communist Party ? its other advocates have included the Union of Bulgarian Artists and the Union of Bulgarian Architects. Even among those who have no love for the communist era, some have argued that obliterating the monument is a denial of the past that, as such, would be unhelpful to the present. Matters reached an extreme this past weekend. In the early hours of July 9, a giant crane that had been brought in to carry out the dismantling of the monument was engulfed in flames, in what was swiftly seen as arson. The fire started at about 3am (the traditional arsonist?s hour, globally). Firefighters responded quickly, but the damage to the crane was so considerable as to be estimated by the owners as adding up to a million euro. The fire upped the stakes in the argument about the monument from chatter on talk shows and on social networks, from peaceful protests for and against it. No one was injured in the blaze, but it can hardly be forgotten that, amid the heady hot summer nights and party season, passersby might have been nearby and at risk of injury or worse had the crane been toppled by the fire. Should the perpetrator or perpetrators ever be caught, prosecutors might want to add attempted murder against an unknown person to the considerable number of possible items on the charge sheet. There can be no defence for committing an act that endangers life and property, especially if the issue is the fate of a monument. Yet the very fact that someone went to such an extreme is the latest illustration of the deep divisions in Bulgaria about the recent past. There is no shortage of such illustrations. Every year, on dates such as September 9 ? the anniversary of the Soviet invasion at the end of the Second World War ? there are rival commemorations, either by those who see the event as having been a liberation or by those who see it as having been the beginning of oppression. Plans are for the damaged crane to be removed and replaced by another that will complete its task. The parts of the ?1300 Years of Bulgaria? are destined for storage at the National History Museum (a place that, by the way, saw the post-communist removal of exhibits from after 1944 and itself remains largely silent on the topic). Sofia municipality plans to put in its place a new monument to the dead of the First World War and the Balkan wars, to replace a predecessor that was removed by the communist regime. The monument will become a matter of memory, and memory itself will remain a matter of dispute. A dispute likely to remain unresolved, and in turn to spawn protests for a long time to come, in a country where politicians apparently believe that the passing years bring dilution, and not aggravation, of problems left unaddressed. Ford Fiesta mit Sync 3: Hier kommt Oberklasse-Flair auf! Is Trump Authoritarian or Incompetent? Yes.